What the what? I didn’t take French in school, so the first time I heard the word atelier was when someone was trying to impress people by calling her new art gallery that. She had basically hung art on the walls of an upstairs office space, and she was no artist herself, but I guess it sounded better to her than “gallery.” It’s always struck me as a bit of an affectation. 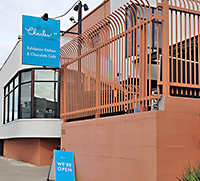 And “chocolatiering?” As somebody who likes to make up words myself (i.e., we at CBTB are chocolateers), I appreciate creativity in naming things, but what does chocolatiering mean? It turns out a chocolatiering atelier is a chocolate workshop in NYC where the customers can make their own professional-quality chocolate candies under the guidance of trained chocolatiers. 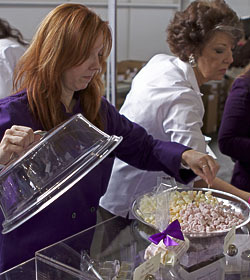 And unlike chocolate classes you might have taken at a local chocolatier’s kitchen, you don’t need a reservation. Drop in anytime, and you can make your own truffles, bars, barks, molded chocolates, chocolate-dipped fruits, even mendiants — those decorated chocolate disks you can buy in French chocolate shops. 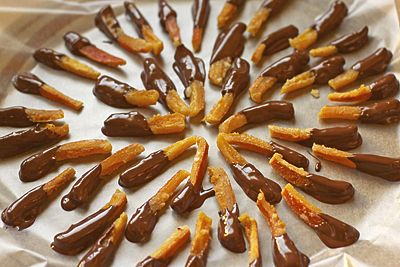 We imagine dipping orange peels in chocolate at Voilà Chocolat is a more glamorous experience than our at-home recipe. Voilà Chocolat, whose slogan is “Make your own happiness,” is similar to stores where you decorate the pottery you buy, only it’s way better because you get to work with chocolate. They supply you with our local Guittard chocolate, already tempered, plus dried fruit, nuts, seeds, cacao nibs, and various candy sprinkles. You can choose which strength of chocolate you want (white, milk or 72% dark), and some ingredients change seasonally. The space includes all the equipment necessary, plus an expert to guide you. And what an expert: Their master chocolatier, Christophe Toury, used to be the Chocolatier Executive Pastry Chef at Jacques Torres, which is believed by many to be the top chocolatier in NYC. Prices range from $35 to make 1/2 lb. 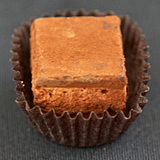 of molded chocolate to $65 to make a 16-count box of various truffles. The mendiant session in which you learn to pipe and decorate 50 mendiants for $58 intrigues me most, and the session in which you mold and decorate 6 bars for $60 looks like the most fun to me. They also sell their own chocolates in the store, along with hot chocolate, espresso drinks, and baked goods. And their website says this is their first atelier, so I think we can see more of these in the future. I love this idea. Why don’t we have this here already? If they can do it on the upper west side of NYC, surely somebody can manage it here. 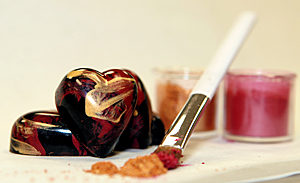 I look forward to seeing what our SFBA chocolatiers come up with. Date posted: January 15, 2015. This entry was posted in American chocolate, Chocolate around the World, Featured, Outside the Bay Area and tagged chocolatier, chocolatiering, DIY, Guittard, Guittard Chocolate Company, hand-dipped, Jacques Torres, mendiant, New York City. Bookmark the permalink.